Jim Kacian's Red Moon anthology of 175 works by 132 authors and artists, with an introduction, an explanation of the selection process and an index of writers and artists. Cover painting: 'Black, White and Gray', detail by Franz Kline, 1959. All rights reserved. This book is republished here with the kind permission of the editors. 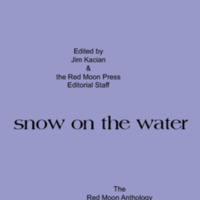 Kacian, Jim (editor in chief), “snow on the water: The Red Moon Anthology of English-Language Haiku 1998,” The Haiku Foundation Digital Library, accessed April 22, 2019, https://www.thehaikufoundation.org/omeka/items/show/47.